This Pandora bracelet is one of my most cherished items and every charm represents something that has been of great importance to me. My husband bought me my first Pandora bracelet on our second Christmas together and filled it with charms that represented my personality.It was one of the most thoughtful Christmas gifts I had ever received and I couldn't wait to fill it. Unfortunately a few months later my Pandora bracelet was stolen from me on a trip to London and I was left heartbroken. For awhile I contemplated not buying another, but part of me always wanted another bracelet to store all my memories. I then bought this second bracelet a year after and have started filling it up bit by bit when something memorable happened in my life. My father bought my mum a charm bracelet when they started dating and both of them filled the bracelet with charms from the places they had visited together. I wanted to do the same with this one. I used to love playing with my mum's charm bracelet when I was younger and we would often sit down at her dressing table discussing each individual charm and where she bought it. I was fascinated by all the stories and couldn't wait to one day start my own 'memory bracelet' - well that's what I called them when I was little. My Pandora bracelet currently has eight charms. The first charm I bought for this one was the Frog Prince as I had a strange obsession with frogs when I was younger and I bought two boxing days ago. This was quickly followed by the house charm to represent when my husband and I first moved in together and then proceeded by the 'Easter Bunny' when we bought our first pet. I then bought the irish clover as my husband is Irish and I was in dire need of luck for my driving test and when I passed my driving test, I bought the London Taxi Cab. At the time this charm was the closest to a car charm I could find. When my husband and I got married last year we both went to buy the husband and wife charm and when I went to Thailand earlier this year, I bought the Asian elephant as soon as I returned to the UK. My most recent charm is the bicycle to remind me of the lovely city break I recently took to Amsterdam. Charm bracelets make excellent Christmas presents and they are a gift that keeps on giving as they can be added to at any time by both the owner and friends or family. As the Pandora shops tend to be really busy at this time of year, it is sometimes easier to look at different official outlets online to purchase these charms. Always remember to look for trusted retailers as there are so many fake outlets on the internet. One place that I've bought my Pandora Charms in the past is the House of Fraser Jewellery* section. They stock a large variety of the Pandora charms, bracelets and rings and as most people wouldn't think to shop Pandora at House of Fraser, you're more than likely to grab the charm you want before it sells out. Above are a few examples of charms from the House of Fraser website that are currently on my wish list. I really need to add some colour to my charm bracelet and both of these teal blue charms would look lovely. 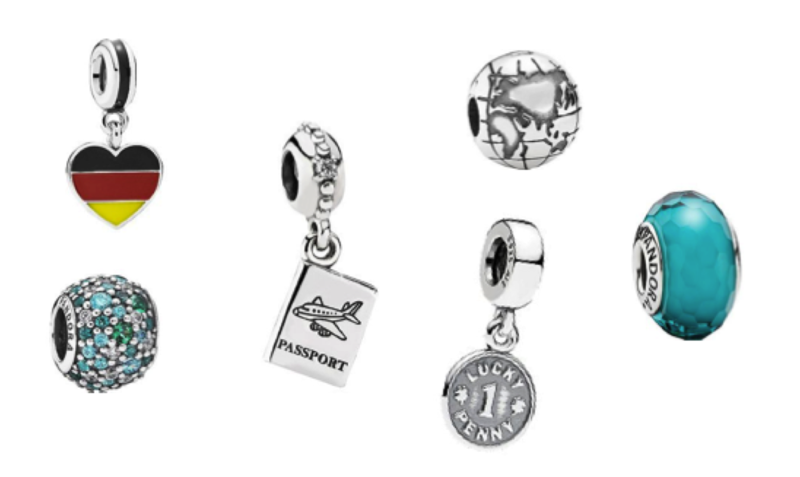 As I've recently developed a love of travelling, I would really like a passport charm and a globe to add to my collection and two weeks ago I surprisingly won a trip to Germany next year so I cannot wait to add a new country to my existing Pandora travel collection. Do you own a Pandora Bracelet?